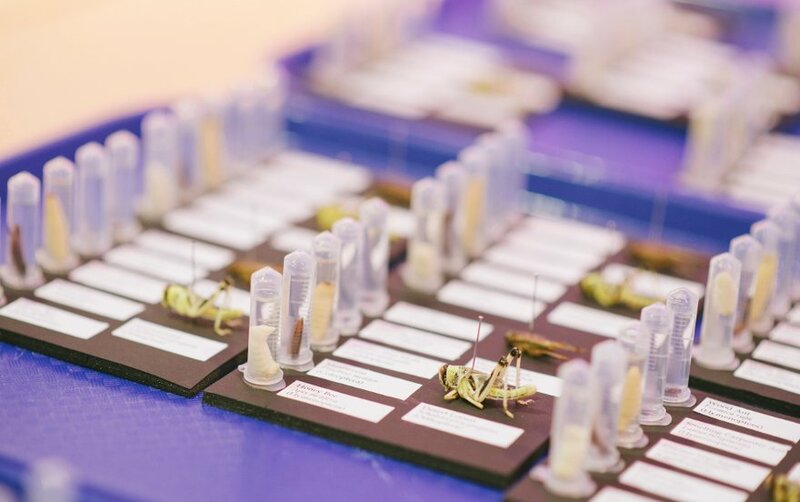 Adventurous vegetarian Crystal Bennes heads to the Wellcome Collection for an experimental insect dinner courtesy of Nordic Food Lab and Pestival. It's been a long time since I've felt properly nervous about doing something. But walking through the double glass doors of the Wellcome Collection building I can’t help but feel a little anxious. Why? Because I'm about to sample gastronomic delicacies from the research arm of a restaurant frequently touted as the world's best: Noma. Only this isn't to be a meal of fois gras or seared scallops; instead, everything I'm about to eat is comprised of bugs. The butterflies in my stomach are about to be joined by their less metaphorical cousins. Welcome to Exploring the Deliciousness of Insects. Grasshoppers, crickets, ants, mealworms, moths, bees: around the globe people having been eating insects as long as there have been insects to eat. And yet, it's an idea which has largely fallen out of fashion in the West. Apparently chocolate-covered ants were a favourite snack-time treat in Victorian England. Who knew? The so-called global food crisis is a popular topic of late, with the world's population expected to increase to some 9 billion people by 2050, and some nutritionists – the evening’s introductory speaker, Professor Marcel Dicke, included – have cottoned on to the fact that lamb chops for all is simply unsustainable at the current rate of production. The dirty not-so-secret secret about meat production is that it's incredibly inefficient: it takes 7kg of crop to make a measly 1kg of beef fit for human consumption*. Given that we'd need 3 planets just to produce enough meat (at current Western levels of consumption, anyway) for 9 billion people, it's easy to see why some nutritionists have turned elsewhere for answers. The solution some have landed on is obvious, if culturally unpalatable for many: bugs. The thing about insects is that, not only are there a heck of a lot of them already in existence (an unthinkably large 10 quintillion by some counts), but that their incredible biodiversity – currently about 850,000 unique known species – means that there's less chance of us wiping out entire species through protein greed. So insects are plentiful, nutritious, high in protein and relatively low in fat. They thrive in cramped conditions and tend not to be carriers of disease. What's not to like? Well, the taste, for one thing. A lifelong vegetarian, I've long pondered the possibilities of eating insects as a way to ethically resolve many issues I have when it comes to eating meat in the 21st century. But that's nothing when it comes to actually eating the little buggers. Which is where the boffin-chefs at the Nordic Food Lab (Noma’s experimental offshoot) come in. Things get underway at the Wellcome Collection with a little G&T to take the edge off our (ok, my) nerves. But this being an insect dinner, it's not just any G&T: it's an ant gin and tonic. The brave people of The Cambridge Distillery chucked a whole load of wood ants into the gin as it was distilling and it’s served up to us with a splash of tonic and powdered carmine for colour. Derived from the smashed up bodies of female cochineal insects, the crimson colour of carmine has long been used to make paints, but is also used in numerous food products – everything from yoghurt to red wine. The drink is good; limey and fresh, plus the carmine leaves intriguing rings of coloured gunk in my glass. Introducing the first course proper is the Lab’s Director, Michael Bom Frøst – a study in disarming bumble charm. I'm not sure if it's a deliberate strategy, but the video showing Jane Goodall discovering chimps using sticks as tools to eat termites straight out of the nest is as amusing an inspiration as I've seen for an haute cuisine snack. And a snack of ants no less, named Chimp Stick, inspired by Goodall's chimps. The sticks are brought out, two to a plate, and are so disarmingly pretty that I actually WANT to eat the bugs. Resting on a piece of smoked juniper wood the "stick", a piece of liquorice root, has been slicked with honey and stuck with an array of seeds, flowers, herbs, specks of freeze-dried raspberry, and ants. Two kinds of ants, in fact: wood ant and carpenter ant. It turns out ants are actually pretty delicious. Limey and sharp. I write in my notebook, like kaffir leaf. 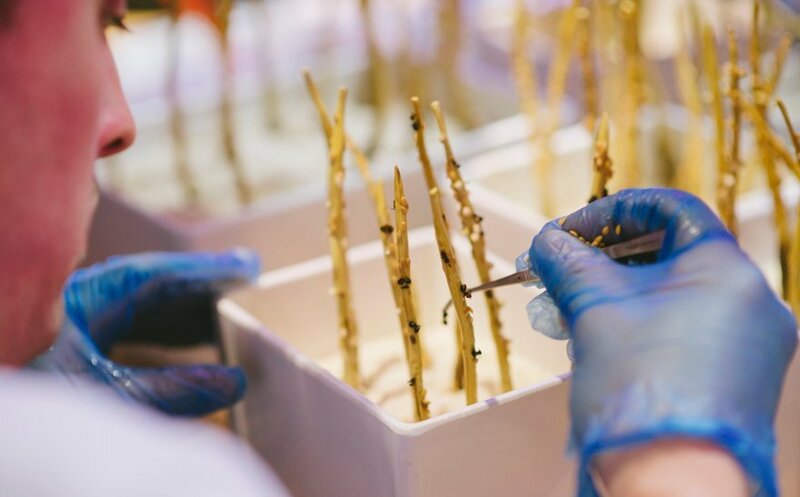 The second course is a fine piece of classic French cooking, wax moth larvae mousseline – made with 51% larvae – served with morels and a rich fermented morel sauce. It's a well executed dish and, at the dinner's close, it seemed to be the dish I heard mentioned over and over as the favourite, but I wonder whether it didn't slightly defeat the point of the insect dinner. If you hadn't told me what was in the dish and set it down in front of me, I maybe would have guessed that the mousse had been let down with something a bit chalky, but I never would have guessed insect, let alone as specific an insect as wax moth larvae. The entire dish is a provocation to look again at the systems which make up our foodstuffs. Next up are some considerably less successful roasted locusts, served at the same time as a cricket broth. I was born in Arizona, a state in the southwestern United States which shares a border with Mexico, and it wasn't unusual to see crispy fried grasshoppers in markets when there on holiday. But those grasshoppers were straight out of the frier, liberally doused in salt – crunchy, savoury, surprisingly palatable. The desert locusts (beautiful looking bugs, incidentally) we're served at Exploring the Deliciousness of Insects taste a bit like they've been roasted in an oven some hours earlier and then reheated shortly before serving: slightly dehydrated, still a bit squiggly and not actually very nice to eat. It’s interesting listening to Ben Reade (Head of Culinary Research and Development at the NFL) explain the concept behind the dish – gastronomic purity as expressed through stock – but the broth made with house crickets and a grasshopper garum is flat out unpleasant: like a bad memory of what might once have been a really delicious miso soup. In fact the only redeeming feature about this course is a big lovely bottle of stout, plonked down on our table just as the wild garlic and ant emulsion (for the locusts) is starting to make my lips burn and tingle. Siren Craft Brewery made a one-off oatmealworm stout just for the dinners and it’s delicious. Rich and thick and, well, stouty. Drinking down two glasses of the stuff, I feel better straight away. Finally, the last course: dessert. Bees. Well not bees exactly, rather the beehive: a quenelle of luscious beeswax ice cream; a honeyed kombucha sauce; "bee bread"; and a glorious honeycomb-patterned honey crisp on top. It’s sensational. Strangely, a lot of people on my table didn't go for the ice cream, but it was my favourite kind of dessert – one in which the primary taste isn't even in the same town as sweet. The entire dish is a provocation to look again at the systems which make up our foodstuffs. Honey is as common as mud, honeycomb less so, and I've even eaten "bee bread" before (my grandmother used to force feed it to us when we were kids), but I can't remember the last time anyone fed me anything made of beeswax. While the culinary talents of the Nordic Food Lab may have helped to make insects that little bit more palatable to a room full of self-proclaimed adventurous eaters, I left the dinner feeling more doubtful about the possibility of insects as saviours than when I went in. What the evening seemed to have been about is how to shift our cultural preconceptions by making the “disgusting” appear more appealing. But maybe we’re looking at the wrong preconceptions. A couple of days later, I was shopping for some groceries in an Asian supermarket, when I noticed that there were no dairy products to be found in the shop. It made me think about the many cultures where the use of dairy products is minimal or even non-existent. In the West, however, dairy is a huge part of our daily diet. My point is simply that the way we think about, and eat, animal-based proteins is not necessarily the "right" way, or even the only way. Despite the much-publicised 9 billion figure, I still take umbrage at the idea that this presents a food shortage problem. Lack of food isn't really the problem; rather, the problems are of distribution, of the stranglehold held by global food behemoths like Monsanto, and cultural issues to do with nutrition and need. So much of what the Western world eats has little or nothing to do with need or even nutrition; it's to do with status, obsession, desire, and a surprising ability to compartmentalise the horrors of industrial food production for the sake of cheap meat. Of course what’s even more interesting is how such patterns are now spreading to developing countries like India and China. In the final analysis, substituting cows and chickens for ants and crickets won't make our problems disappear. The problem with substituting one animal-based protein with another is that you only change the contents in the box, you don't actually change the box. By the box, I mean the industrial system of food production. 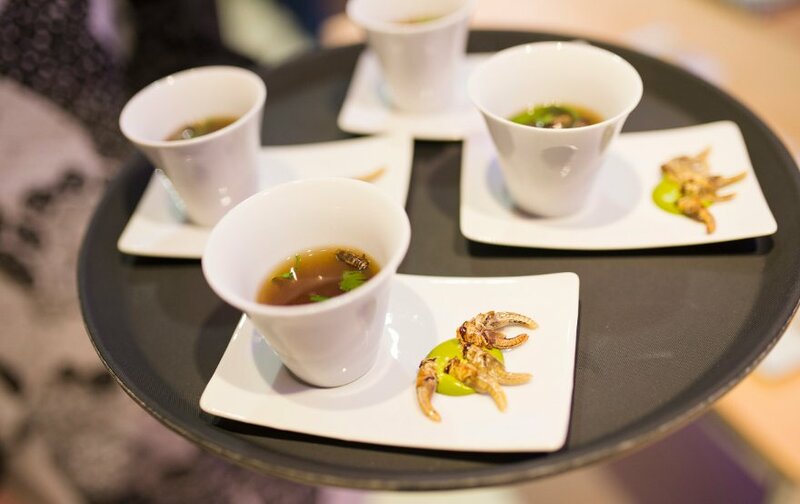 When introducing the cricket broth dish, Ben talked about the fact that unscrupulous cricket breeders already exist; breeders who feed their crickets fish food. It’s not significantly different from existing problems around animal feed which have led to diseases such as BSE. How long, I wonder, before cricket breeders start feeding their crickets ground-up mealworm? Ben also said that breeders who feed their crickets fish food wind up with crickets that taste like rotten fish – which alerts us to another issue here. Surprisingly perhaps, a lot of chefs – especially those operating at the level of fine dining – aren't actually all that concerned with the ethics of industrialised food production systems. The very best flavours and textures – that is all that matters. The fact that these come from well-treated animals is arguably just a coincidence. And besides, the supply chains of fine-dining restaurants are so rarefied as to operate outside the significantly larger, and more environmentally impactful, world of commercial food mass production. * This figure read 10kg of grain for every 1/2kg of beef when we originally published the article. It is in fact 7kg of grain per 1kg of beef, and even that figure is disputed, with Tim Worstall arguing in Forbes that it only applies to US-style feedlot production. Thank you to the reader who pointed this out! This article was first published in The Journal of Wild Culture, May 14, 2013.